One of the things I like about my morning walks is looking at all of the houses in my neighborhood. I love imagining who lives in each house based on the curb appeal of the home. There are some beautiful homes in the neighborhood where I live, and they are so varied. Some have beautiful yards filled with elaborate landscaping, some have gardens of wildflowers, and some are very stark and bare. When I look at the last of these, I often wonder who would buy a beautiful home and then leave it looking so unloved. 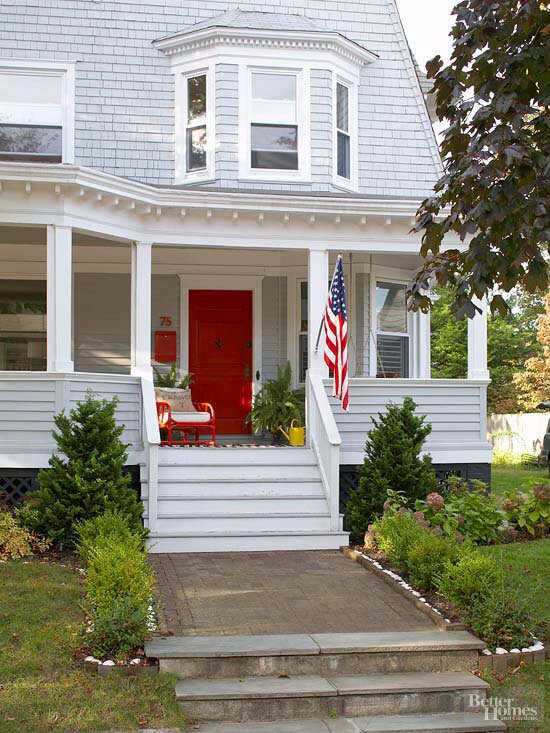 So what are some ways to give your home curb appeal? I found these great ideas on Better Homes and Gardens. The mailbox is often the first thing people see these days. 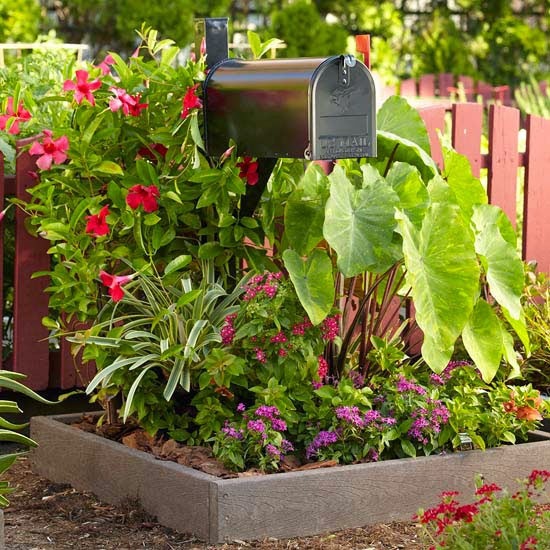 In most neighborhoods the mailbox is next to the street for easy access by the mail carrier. I love the garden planted around this simple generic mailbox. 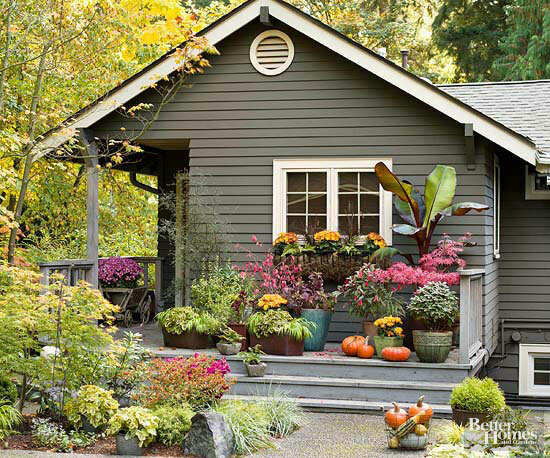 I love a yard filled with gardens, and container gardens are a good choice for porches. The containers can be moved around and the flowers changed according to the season. I love the stone accents and the iron railing that leads you to this beautiful entryway. What a wonderful serene feeling. 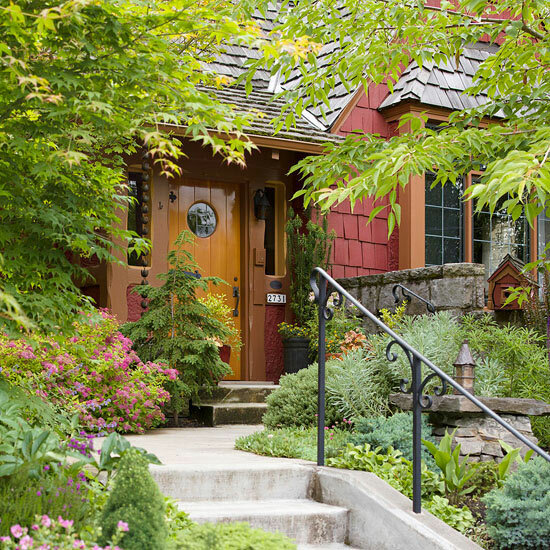 A blast of color on the front door immediately draws the eye to this home. It beckons you up to the beautiful front porch, where a comfortable chair is waiting for an afternoon of watching the world go by and greeting your neighbors. 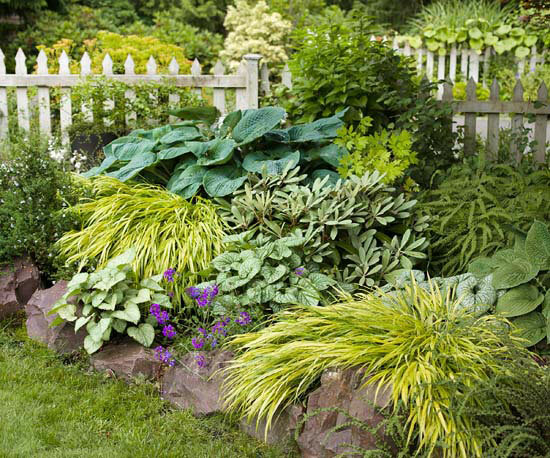 Keeping your planter beds clean and filled with beautiful plants says that you care for your home, and once again a stone wall adds so much charm. 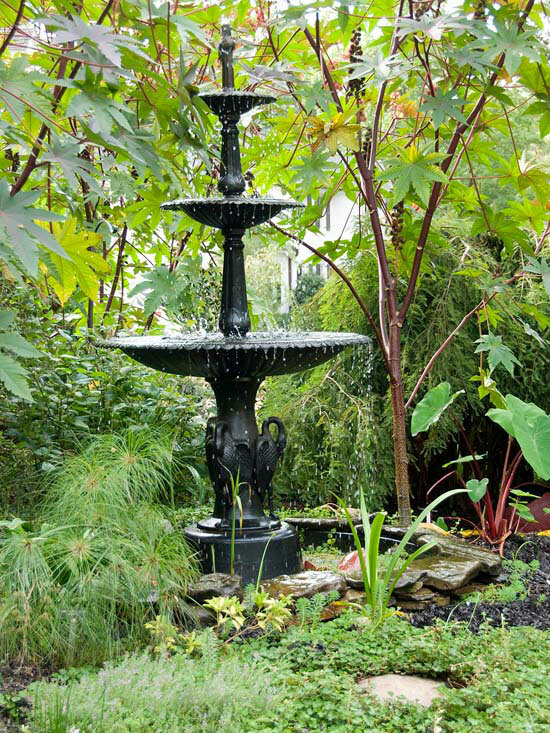 Garden embellishments add so much to a yard, and for me there is nothing more soothing than a water feature. There are so many things that add visual interest to your home's exterior. Sometimes I just want to knock on a door and either say, "wow great job", or "wow what in the world were you thinking". But, I just keep on walking. all photos from Better Homes and Gardens. I think the same thing, Vicki and sometimes I wonder if they might have spent so much to get a big house that they don't have anything left over for decorating. I am always out in the garden working, pruning, moving, plucking, watering...sigh. But it leaves little room for other joys. Those beautiful gardens do take time, and you have to have a real love for it. That's where a few well placed containers with bright flowers can take the pressure off easily. A nice shrub or two...I might have to rethink my gardening plan in the next few years because I would love to be able to enjoy my yard as much as my neighbors do. Some of these are so intriguing! Until we get our front porch finished, I'm pretty glad our house sits a long way from the road. :-) And I do love the idea of all the flowers in containers which can be moved to follow the sun. Pots should start going on sale about now, I would think. I need some! Oh, how I miss my water feature, and it's been three years since I left TX. I think some people just stay in their air-conditioned houses and don't even know what they have in their yards. Especially if they have the help maintain it. I like to walk around my subdivision and look at peoples yards too. Funny, I think the same thing. Some people do a better job than others at taking care of their lawns. But, I've also learned not to judge too harshly since sometimes I've learned that they're having a crisis in the family that shifts their priorities at the moment. I always like to get ideas of those that have such pretty manicured yards though. We live on a hill and have a lot of junipers on the hill to help with erosion control. So our grass is limited to the top and bottom of our yard. We also have a lot of trees, so that can sometimes interfere (or help) our grass growth. We need to put out fresh pine straw right now. That's bugging me right now. Wish we wouldn't wait so late in the year because soon the leaves will be falling in it! Thanks for taking us on your morning walk of beauty. Love great curb appeal. That is one thing that will be worked on slowly at the new house. Hope to begin in the fall. Great time to plant. 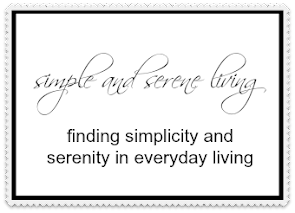 Beautiful inspiration photo's. I have to agree with you the curb appeal shows a lot about the people that live in the home. A loved and well kept home is so nice to see. I think it shows a happy life inside the walls is going on.